While unlimited 4% cash back on dining and entertainment is one of the best credit card offers out there, is it worth an annual fee? A solid contender if you value a big sign-up bonus and can take advantage of the best-in-class cash back for restaurants and entertainment. Capital One offers some of the best travel rewards credit cards on the market. With the introduction of the Capital One® Savor® Cash Rewards Credit Card, which offers one of the highest cash back rates for dining and entertainment out there, they’re introducing a premium cash-back card to the mix. That, plus a generous cash bonus makes it tempting, but the card does come with an annual fee. Is it worth it? Unlimited 4% cash back on dining and entertainment -- This is one of the highest cash back rates out there on dining and entertainment, and it’s unlimited. This means that for every $1,000 you spend on restaurant bills, bar tabs, concerts, sporting events, theme parks, and more, you’ll get $40 back. 2% cash back on grocery stores -- You’ll also get 2% cash back on any purchases you make at supermarkets. Superstores like Walmart and Target are excluded. $500 cash welcome bonus -- If you can spend $3,000 in the first three months, you’ll get a $500 cash bonus. Annual fee waived the first year -- The $95 annual fee is waived the first year so you can make sure this card is right for you at no risk. Flexible rewards redemption -- Redeeming your cash back with the Capital One® Savor® Cash Rewards Credit Card is simple, and you can redeem any amount at any time. Many other competing cash-back credit cards have minimum redemption requirements. No foreign transaction fees -- If you ever travel abroad, it’s important to have a credit card that won’t charge you fees on every transaction you make. I save hundreds of dollars -- often thousands, even -- per year by maximizing the way I use rewards credit cards. I’ve held over a dozen and used them to pay off over $8,000 in debt interest-free and accumulate more than a million airline miles and hotel points. I’m also a personal finance writer by trade with a focus on credit cards, so I’ve spent hours reading over credit card terms and conditions and looking for the latest, greatest credit card offers. Annual fee -- Though it’s waived the first year, the $95 annual fee is definitely something to take into account. If you can’t spend enough to make more than $95 in cash back, don’t get this card. However, there is a no annual fee version of this card, the Capital One® SavorOne℠ Cash Rewards Credit Card if interested. 0% introductory APR offer -- It’s hard to ask for more perks with such a generous rewards rate and sign-up bonus, but an introductory 0% APR offer on new purchases or balance transfers would make this card even more useful. You should have good credit to apply for the Capital One® Savor® Cash Rewards Credit Card. This means that a FICO® Score of at least 670 will get you a good chance of receiving approval. The lower your credit score, the harder it will be to receive approval for this card. It’s worth noting that no credit score will guarantee approval. There are several different kinds of cash-back cards. The Capital One® Savor® Cash Rewards Credit Card is a tiered cash-back card, but it’s important to know the difference between each type. These are cash-back cards that offer flat-rate cash back, such as 1.5%, on all purchases. While they don’t always offer the highest overall rewards, cardholders often prefer these cash-back cards because they’re simple, good everyday spending cards. These are cash-back cards that offer 1% cash back on regular purchases and a higher cash back rate, such as 3% or 4%, on purchases in a specific category. These categories range from dining and travel to groceries and gas stations. If you do a lot of spending in one category, these cards can be very lucrative. Rotating cash-back cards offer higher rewards rates, such as 5%, on bonus categories that change each quarter. One quarter the card may offer 5% cash back on office supplies and utilities, and another quarter it might offer 5% cash back on supermarkets. Every cash-back card is different, but there are a number of commonalities. Here are some important factors to look at when choosing the best offer for you. The rewards rate. How much cash back are you getting on various purchases? This is the central feature of a cash back card. Bonus categories. Does the cash back card offer additional rewards on certain spending categories? If so, you’ll want to make sure that you spend enough in those bonus categories to make the card worth it. You should also factor in whether the cash back in these bonus categories is capped or unlimited. Sign-up bonus. Not all the best rewards cards offer a sign-up bonus, but a good welcome bonus is a great way to add significant value to your first year as a cardholder. Annual fee. It’s easy to find a cash back card with no annual fee. Of course, the cards that charge an annual fee offer higher rewards rates. Ease of redemption. One of the biggest mistakes people make when choosing a rewards credit card is selecting a card that offers rewards they can’t redeem. It’s important to consider both how flexible your rewards are and how easy they are to redeem. There's no sense going into debt and earning rewards at low single digit rates while interest charges pile up at far higher double-digit rates. Pay your balances off monthly to avoid interest charges and harvest the full value of lucrative rewards programs to make your money work harder for you. Determining the value of any rewards credit card will always depend on your spending habits. The Capital One® Savor® Cash Rewards Credit Card offers fantastic rewards for those who spend heavily on dining and entertainment and average rewards for heavy spending on groceries. The table below gives you an example of how various spending profiles can profit off of this credit card each year. As you’ll notice from the table above, it’s not difficult to recover the $95 annual fee on the Capital One® Savor® Cash Rewards Credit Card. By spending just $500 per month -- $75 of it on dining and entertainment and $300 on groceries -- you’ll make $123 in annual rewards, pocketing $28 per year after paying the annual fee. It’s wiser to use this card for dining and entertainment while alternating it with other cash-back cards that offer higher rewards on purchases outside of that category. Some cards offer up to 6% cash back on supermarket purchases, although this is usually capped on a certain level of spending. If you were to only use your Capital One® Savor® Cash Rewards Credit Card for dining and entertainment purchases, you’d need to average at least $198 per month on dining and entertainment to recoup the $95 annual fee. 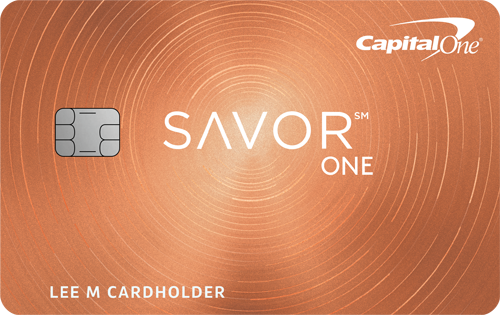 Capital One offers two Savor-branded cards, including the annual-fee version covered here and the no-annual-fee version, Capital One® SavorOneSM Cash Rewards Credit Card. A quick side-by-side comparison can help you determine which card may be a fit for you. Spending enough to recoup the annual fee doesn’t necessarily mean that the Capital One® Savor® Cash Rewards Credit Card is the best card for you. If you’re only making $28 off of a rewards credit card, you could likely get a higher return from another card. While the return on grocery spending is decent, there are credit cards that can get you a better return on supermarkets, so you shouldn’t choose this card just for the 2% cash back on groceries. The Capital One® Savor® Cash Rewards Credit Card is best for people who spend a lot of money on dining and entertainment, as an unlimited 4% is one of the best rates on the market. If you spend at least $200 per month on dining and entertainment, you can make back the annual fee on this card from that spending alone. If you spend $750 per month on dining and entertainment, you will profit $265 from just that spending. The former group will want to consider the sign-up bonus, and their spending alone won’t get them significant cash back. However, for those in the latter group who spend significantly more on dining and entertainment, this card is an obvious choice. This will include everything from your address and your social security number to your income and monthly housing payments. You should get a decision within seven to 10 days, but you may receive a decision immediately.